We are creatures of habit – especially when it comes to our food choices. The holidays are no exception as we whip out our traditional dishes that we make year after year. Green bean casserole, stuffing, rolls…you know the drill! However, once in awhile it’s fun to switch things up and try something new. If you’re a little hesitant to experiment with a new dish, why not start small with just one thing? Potatoes. Potatoes are one of those dishes that doesn’t get a lot of thought. For most people, either you serve them mashed or in a basic cheesy casserole. While potatoes are good in and of themselves (I love potatoes in every form!) surprise your guests and give your casserole a little upgrade this year! 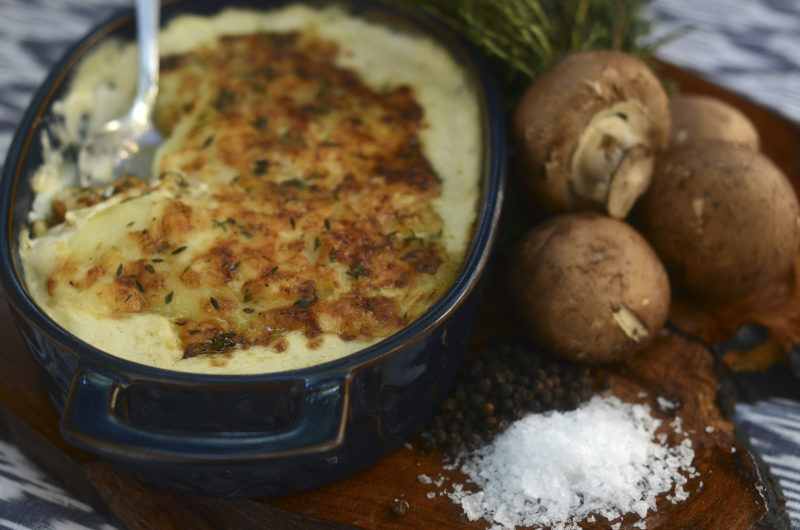 Our Savor team came up with an elegant potato casserole that was not only easy to make, but would wow your guests and look pretty on your table, adding a sophisticated flavor to your menu. Give it a try! Position rack in center of oven and preheat to 350°F. Generously butter 9-inch-diameter glass casserole dish. Place dish on rimmed baking sheet to catch any spills. Combine cream and garlic in small saucepan and bring to simmer over low heat. Cover and remove from heat. Arrange 1/3 of potato rounds, slightly overlapping, at the bottom of the prepared dish; sprinkle with 1/2 teaspoon thyme and season lightly with salt and pepper. Pour 1/4 cup garlic cream over. Repeat layering 2 more times with remaining potatoes, thyme, salt, pepper, and garlic cream. Pour remaining garlic cream over, then 1/4 cup milk. Then sprinkle with the gruyere cheese. Bake gratin until golden on top and potatoes are very tender, usually about 1 hour or so. Let potato gratin rest a bit before serving. This dish is obviously not the best for those with a dairy allergy or who are lactose intolerant, but we could come up with a modified dish for you if you purchase one of our personalized holiday meals. You have until November 19 to book your Thanksgiving meals, and when you do you’ll get a complimentary charcuterie board! ($100 value).